I wonder if there has ever been a study into why people like one color and not another. Or... why you will like a color now, dislike it later, or vice versa. When I was around 11 years old everything had to be mauve. I wonder if it's because my birthstone is the amethyst? I went through an orange period in my teens. I wanted to paint my entire room orange but my parents thought it was a bad idea. (Do you think?!!) They did allow me to paint the inside of my bedroom door orange, however. For the past couple of years I've been enamored with turquoise in all it's shades. I love going to New Mexico and turquoise and salmon/coral/orange colors are everywhere which, to me, is a wonderful combination. 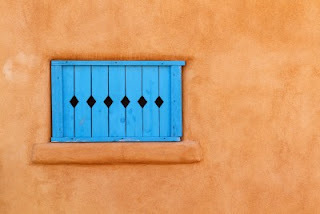 Actually, I like all of the Southwest colors and have brought home a number of things that remind me of the Southwest. So now, this brings me to my latest yarn purchase - hand dyed yarn from Expression Fiber Arts. The funny thing is, this yarn that puts me so much in mind of the Southwest was dyed in North Pole, Alaska! The official color name is Caribbean Sunset, but it will always be "Santa Fe" to me. I love, love, love this yarn! I'm thinking ahead to making another afghan but I haven't yet worked out the design details. I may knit the same pattern that I used for Makayla's blanket, "Floyd", the Sock Yarn Blanket, and the in-progress "I've Got The Blues Blanket" (30% complete). Ravelry links: Floyd, Sock Yarn, Blues.Yes, I do like the pattern. Then again, I may try out something original. That's the way I'm leaning today, tomorrow may be another story. In the meantime, I'm collecting the yarns, which is a good part of the fun. 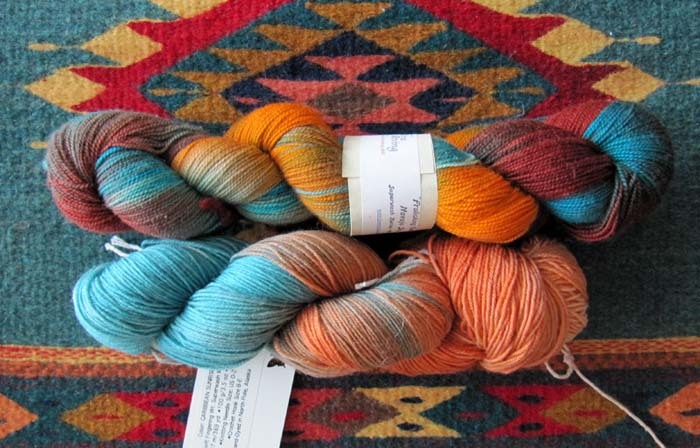 You can see the similarity to the Expression Fiber Arts yarn (below, bottom) to the colors of Frolicking Feet "Navajo Sky" (below, top) from Done Roving. They are very similar except for the addition of dark reds in the latter. 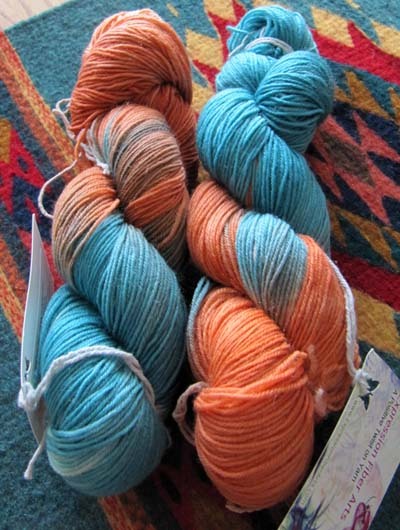 I'll be on the lookout for solid colors to match the two variegated colorways I have now, and any other Southwest colors (sand, just the right blue, red, yellow or green, for example). I'm heading back to Santa Fe in early May (Cinco de Mayo!) and perhaps I'll see something that speaks to me at one of the local yarn shops. New Mexico is known as the Land of Enchantment and I couldn't agree more.